Fossil fuel usage compromises environmental, human, and global health. Our cities are structured around these vehicular arteries clogged with traffic either at standstill or speeds dangerous to residents. Cars put out noxious pollution causing acid rain or asthma, and run on an imported, limited fuel. Studies have also shown that automobile-reliance is associated with obesity. In contrast, alternative forms of transportation, whether walking to the bus or biking a few miles, increase health and well-being. The export of carbon dioxide by transportation is astronomical, accounting for 26% of global emissions. Reducing vehicle miles traveled is integral to abating climate change and preventing global environmental disasters. 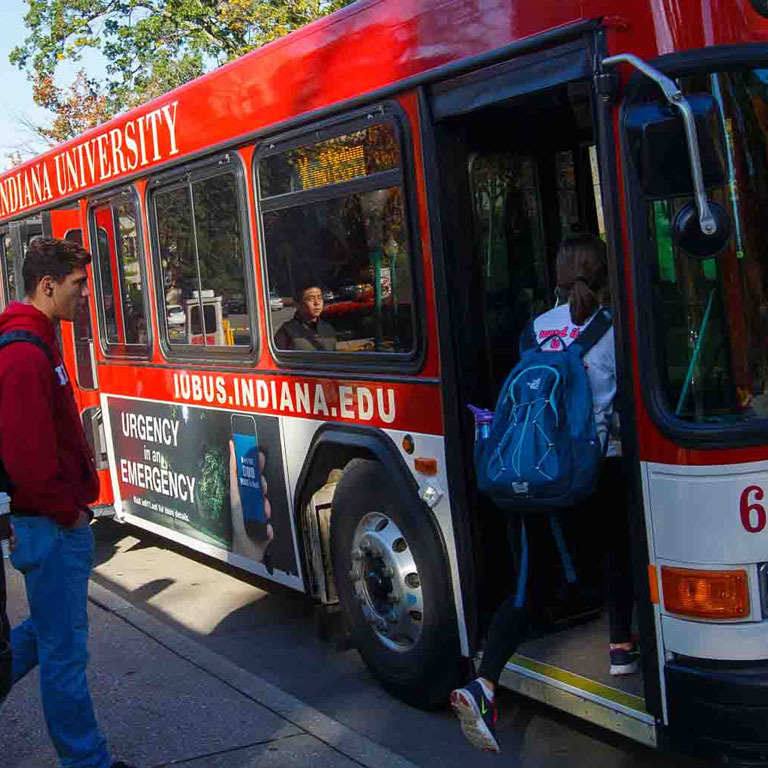 The advent of the fuel-efficient vehicles has lowered the impact of participating public transit programs, such as the Bloomington Transit, IU Campus Bus. Additionally, planning carpooling routes and long distance rideshares, as well as utilizing biking and walking routes ensure we're one step closer to a more accessible campus. There are many benefits in reducing drive‐alone commuting to IUB, ranging from financial to health advantages for people individually and as a campus on the whole. 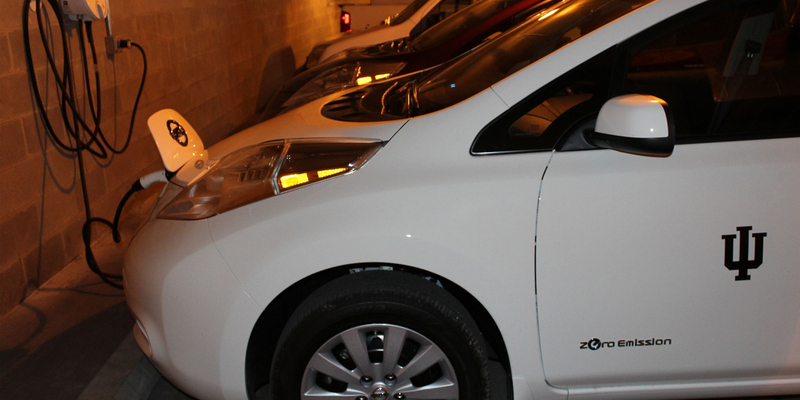 Indiana University is poised to lead the way in sustainable campus transportation solutions. We are home to a top-of-the-line campus bus system and to the number one campus cycling event in the Midwest. We can capitalize on these resources to lead the charge in reducing vehicular traffic and emissions. A recent addition to these efforts include the University/City bike share program. Read more about current initiatives below. Also look into the resources provided to learn more about how IU is promoting active transportation options to ensure a more connected and sustainable campus. Through the 2020 Vision Goals, the University is focusing on increasing the use of sustainable transportation by staff and faculty by 30% by 2020. 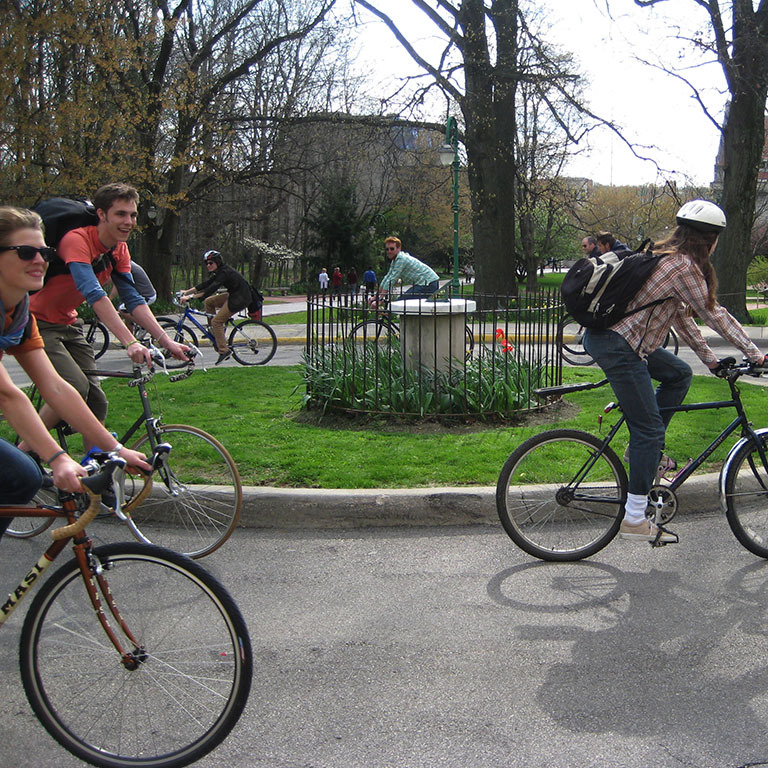 To accomplish this goal IUB must provide a range of transportation options, to increase the use of low-impact modes of transportation—such as bus, bicycling, walking, carpooling and car sharing—to ensure a more connected and healthy campus. Alternative transportation options such as: Bloomington Transit, the IU Campus Bus, Pace Bike Share, Zimride, and Zip Car, help reduce automobile use; and are key to fostering a sustainable future. A continuously updated collection of resources can help you sustain IU to improve active transportation options across the University. Membership in the Transportation Working Group is open to students, faculty, staff, and community members. To join or receive meeting information, co-chaired by: Julie Hardesty, Amanda Wilson, please contact us. The first Friday of every month (2/1, 3/1, 4/5) from 9:00AM-10:00AM at the E-House.